Disclosure: I received this product for review from the wholesale vaping supply company Hawk Vape for review purposes. If I’m being perfectly honest, whoever is in charge of branding this device isn’t terribly good at their job. After all, the name is simply the name and capability of the chip driving the device. From a design standpoint, the box is fairly pedestrian as well. Not that it’s poor quality or anything. It’s a nice aluminum body with rounded corners. It’s also available in a bunch of colors. There are some nice features to be had in this box as well. First is a shallow, but generously wide drip well surrounding the top-mounted 510 connector. This feature came in handy since I’m drip challenged and about the only thing I have that can handle anything near 50 watts are all RDAs. Along one side of the box is a very shallow surface-mount fire button in silver. The button has a raised bezel around it bringing the button and bezel top flush with one another. This helps minimize firing accidentally. The button is a good size and is easy to activate. It has a firm press to it and is very responsive. Around back, you’ll find the battery door. The door is basically the entire back panel of the SX300 mod. Two screws secure the panel in place. Remove the screws to access the 18650 battery compartment. 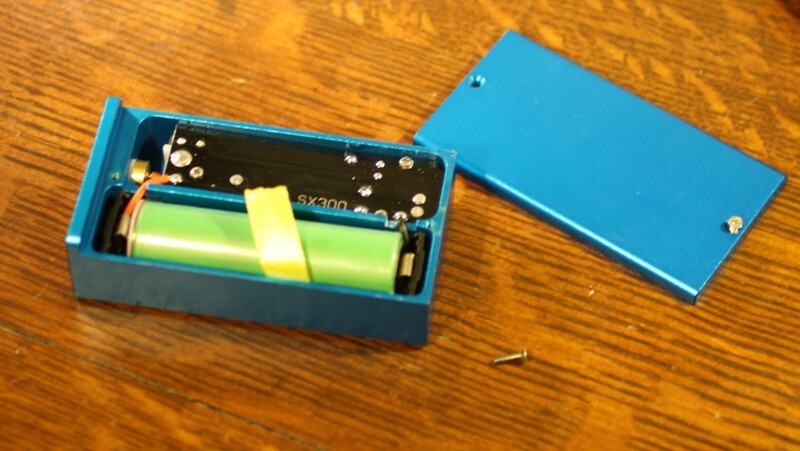 A battery is not included with this device, so you’ll need to get in that compartment at least once. If you prefer not to constantly undo the screws to charge the battery, a front-mounted micro USB port is available to charge the battery in place. Yes, you can use the device while the battery is charging. A small hole in the body next to the USB port allows a red LED light to shine while charging. The light changes to blue when the batteries have been fully charged. Above the battery is a small square opening for the OLED display. The display has the typical readouts for a modern APV device. This includes the current wattage setting, operating voltage, battery graph, resistance and actual voltage level of the battery. There are no other markings or ornamentations on the box which sort of adds to the plain Jane feel of the box. Then again, too many APVs are plastered with logos, so it’s refreshing to not see any gaudy decorations. You may have noticed in the previous section how I didn’t mention adjustment buttons. That’s because there are none. 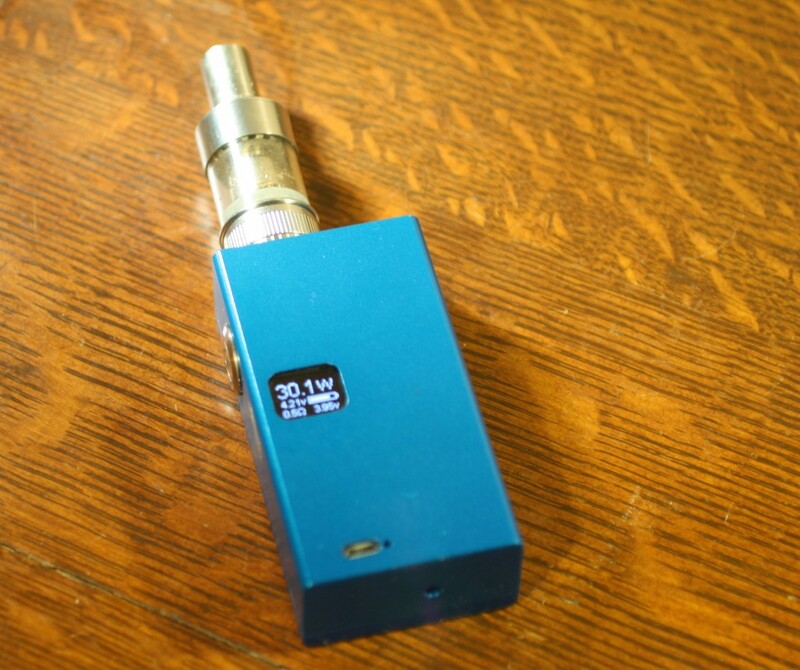 Like the Sigelei APVs, this box uses the gravity sensors in the SX300 chipset for adjustments. To make adjustments, click the fire button 5 times to enter the menu system. To adjust a setting, tilt the device to the left or right and it will step through the adjustments (it will go faster the further you tilt it). To access other menu settings, click the fire button once. Of course, with a top speed of 50 watts, it still might take a while to adjust up to the full power. I think it’s better to move wattage in .5 watt increments because there’s such a small volage increase when adding .1 watt to anything. The other question in my mind is how necessary is 50 watts (or more)? It’s probably bad form to answer my own question, but I will anyway. It’s all about the overhead. I have a few tanks and atomizers (mostly rebuildables) that work well at 30 watts, but either can use a smidge more power or give the APV trouble running at maximum capacity all the time. The additional capacity can be handy. Just because you have the extra power doesn’t really mean you have to use it all. That didn’t stop me from trying to use all the power. I tried a few different things like the Exthermal, Lemo, Subtank and even the Atlantis Hawk Vape sent me for a previous review. The RDA came closest, but even then 50 watts was just excessive. I got a build on the Exthermal that did well at 40 watts, at least briefly. 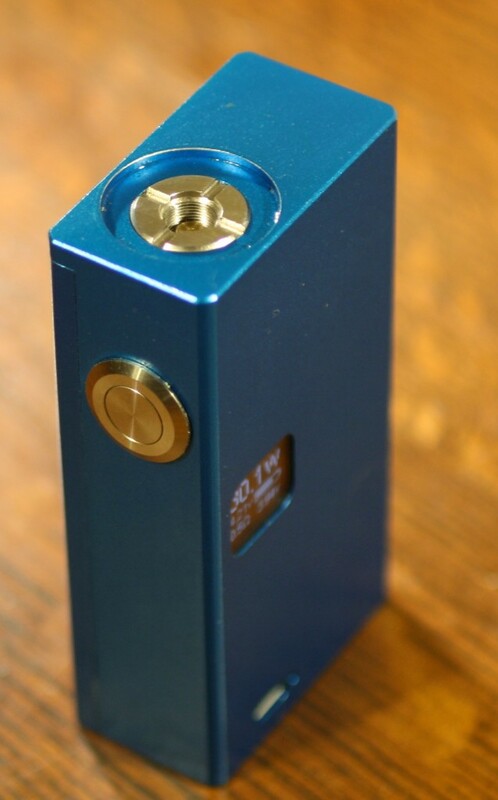 At least it helped me figure out that the SX300 box mod does have the power to back up the name. It is worth mentioning that the power is fleeting. When you’re pumping out as much power as a household lightbulb, it takes a lot of battery capacity. Granted, there will be some variability depending on the battery, of which you should be using something with a high amperage limit. Running at wattage settings below 30 watts, battery capacity isn’t too bad, of course. That is the nice thing about something with higher capacity. Having the power, but also having the ability to not use it. 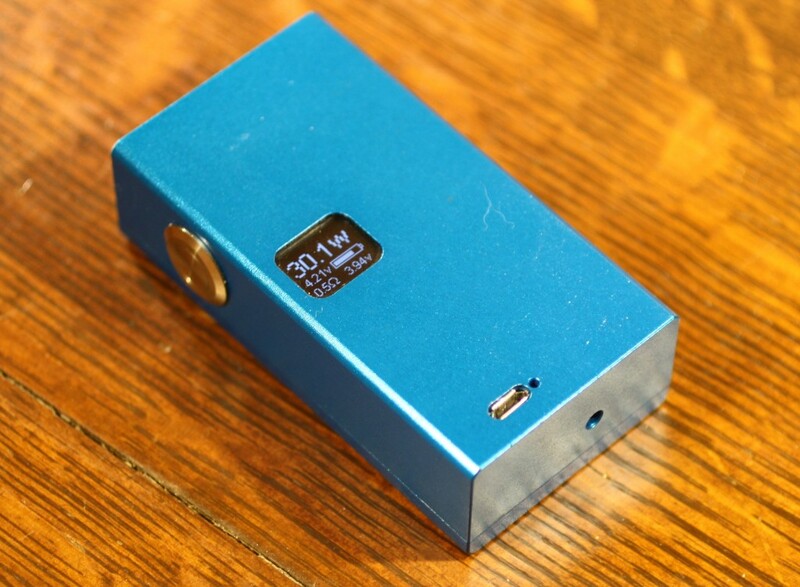 The SX300 50 Watt box mod performs admirably. I’m surprised they didn’t give it some kind of hyped-up name like the Eliminator-o-matic or something. The device also has some fairly generic looks. But, sometimes it’s not about looks, but how it runs. Check out your favorite retailer for availability. Retailers, you can visit Hawk Vape to get more details on wholesale purchases. In addition to the products I’ve mentioned they also have good deals on Kangertech wholesale as well. 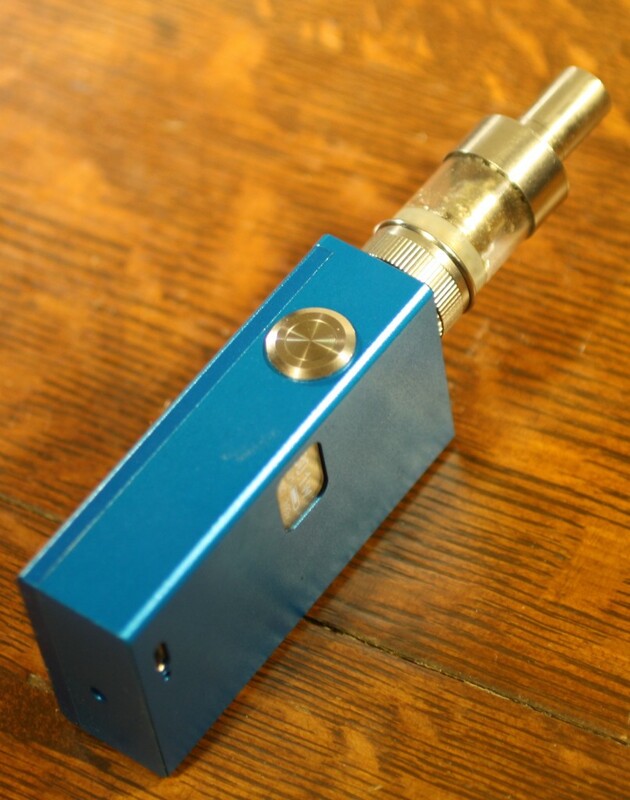 Post by Steve K’s Vaping World E-cigarette Reviews and News.